*Please make all payment cash or check at the door. Uwe Hessinger & Colleen Suzanne from Portland, OR. 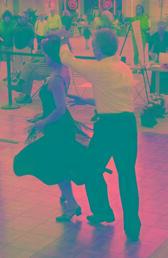 7:30 - 11:00pm: Don't miss our fabulous "Opening Party & Waltz Mixer". Pre-registration for workshops required to ensure class balance. Taking your Waltz turns to new heights! 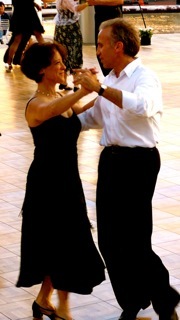 Partner Dancing with flow and ease through beautiful moves. 1:15 - 2:05 "Open Cross-Step Variation"
2:10 - 3:00 "Dynamic Left Turn Variations"
- Under Arm Turns which travel and flow. Taking off the brakes. 3:10 - 4:00 "Right Turn Cross-Step Variation"
4:05 - 4:55 "Some favorites from Portland"
WHERE: Om Culture Center, 2210 N. Pacific Street, Seattle, WA (near the corner of N. 35th and N. Pacific Street, near Gasworks Park in the Wallingford neighborhood). The building has "Om Culture" printed visibly on it's side, so it's fairly easy to see from the road. There is ample parking either in front of the building on North Pacific Street, or on North Northlake Way (just across the street from Om culture, next to the Burke-Gilman Trail), or on any of the nearby residential streets. Om Culture's front door is located on the North Pacific Street side of the building, facing Lake Union. Pre-registration for Saturday workshops required to ensure class balance. We are very much looking forward to coming up to Seattle this weekend and bringing our favorite waltz material to you. We think that you will enjoy the moves and will find tips on some technique and styling helpful and fun. Here is list of variations and related fundamentals which we are bringing up for you.